Imagine a world where water is precious and every single breath you take could potentially infect you with a fatal disease. 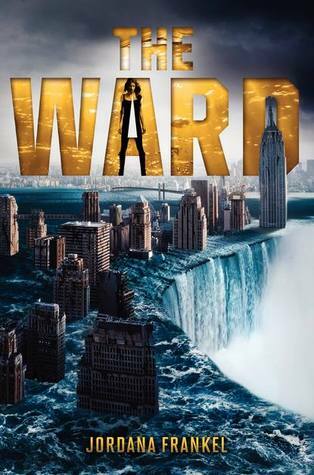 Set in Manhattan, The Ward depicts a world meant for horror stories, a world where pollution has overrun everything and led up to the creation of a disease that consists of invasive, deadly tumors. Ren, a gutsy girl living in this squalor, is the main character and a character that the reader is sure to root for. She begins the novel with a carefree, cold-shouldered manner...a girl who is used to losing everything and everyone. By the end of the first chapter, Ren has progressed to potentially care for her "sister," a fellow orphan. The plight of her sister, sick with this illness, dictates Ren's every move. She must win races in order to get enough money and clean water; she must remain by her sister's side, helping her through the worst of the disease's symptoms; when Ren is approached by the government to look for freshwater, she must accept this dangerous deal in order to better her sister's chances for survival. Ren's character is admirable. She is brave, direct, and a little bit foolhardy; in other words, her character contains all of the traits for a potentially outstanding female lead. Her character is slightly complicated by romance...one with a charismatic, enigmatic young man; however, Ren is more of a character "unto herself," she holds her sister high in her esteem and not many others. Her sister, Aven, is tiny and unhealthy; she is reminiscent of a small bird or animal who is constantly happy (or attempts to be), but needs constant care. Callum is a young scientist with promise; his character is impressive in the sense that he has the ability to change the shape of the world with a potential cure, but he is also condescendingly annoying, at times. Derek, the elusive love interest, was nice enough; however, Derek's character kept so many secrets from Ren...and the reader that he became more annoying than anything. Overall, The Ward is a thought-provoking, conversation-starting novel that will make the reader think deeply about issues such as pollution and/or water deprivation and/or diseases. The characters are interesting and easy to root for and the plot is fast-paced. This book is highly recommended to young adult/teen readers. This is the first time I've heard of this book. Got to put this on my list! So looking forward to this! Great review!